A private spaceship built to launchspace tourists onsuborbital joyrides could by flying on its own by this fall, SPACE.comhaslearned. The SpaceShipTwospacecraft VSS Enterprise, which the space tourism companyVirgin Galactichas been flying on test flights attached to a huge mothership, couldmake itsfirst drop flights over California's Mojave Desert for glide andlanding tests. "There's a reasonable possibilitythat we could see thefirst drop flight in the fall, but as always, everything is predicatedonthoroughness and safety," Virgin Galactic's commercial director StephenAttenborough told SPACE.com in an e-mail. "No corners will be cut inorderto achieve arbitrary deadlines." SpaceShipTwo is designed to carryeight people (sixpassengers and two pilots) on suborbital flights that would reach outerspacefor a few minutes before returning back to Earth. The spacecraft isdesigned todrop from a mothership, called WhiteKnightTwo, from an altitude above50,000feet (15,240 meters) and fire a hybrid rocket motor to launch intosuborbitalspace. At $200,000 a ticket, payingpassengers on SpaceShipTwo willexperience weightlessness and glimpse the darkness of space and theview ofEarth below. 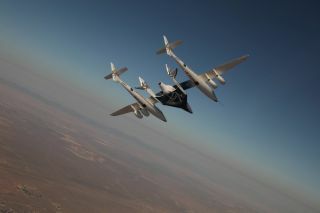 SpaceShipTwo is one of several privatespaceships under development for space tourism or othercommercial uses. The upcoming drop test will follow aseries of test flightswith SpaceShipTwo safely attached to its WhiteKnightTwo mothership, themostrecent of which occurred last week. That test flight marked the firstcrewed SpaceShipTwo flight. In the wake of that success, VirginGalactic is planning topush forward with further test flights of the new spacecraft. Therecent crewedcaptive-carry test flight of the vehicle went very smoothly, they said. "The flight lasted over 6 hours andnumerous combinedvehicle systems tests were conducted," Attenborough said. "All theobjectives of the flight were met." The exact schedule for future testflights, and the firstcommercial flights, is flexible. "Scaled will need to evaluate thedata from this recentcaptive carry flight before we know [when the next test will be],"Attenborough said. "It is true to say though that to date testing ofbothvehicles is progressing very smoothly." The first passenger flights will notoccur until anexhaustive test flight program is completed, and the spacecraft havewon allnecessary regulatory approvals, he said. The SpaceShipTwo spacecraft and theirWhiteKnightTwomotherships are built for Virgin Galactic by Mojave,Calif.-based ScaledComposites, which was founded by veteran aerospace designer Burt Rutan. SpaceShipTwo's predecessor, thesmaller suborbital craftSpaceShipOne also designed by Rutan, won the $10 million Ansari X Prizeforreusable, piloted suborbital spacecraft in 2004. That vehicle wasfinanced byMicrosoft co-founder Paul Allen and also built by Scaled Composites.